The area of Sani, on Kassandra’s western coast, is mentioned by Herodotus and Strabo as being an ancient city founded on the hills of the Xerxes Canal by settlers from the island of Andros. The place was uninhabited in the mid-20th century, a wild marsh, thick with vegetation and pests. In 1961, public contractor Anastasios Andreadis and civil engineer Leonidas Zisiadis spied the location when traveling by boat from Moudania and were impressed by its savage beauty. Here, they knew, they could create a world-class resort. They bought the land from a monastery on Mt Athos. The next eight years were spent draining the marsh, exterminating the mosquitos, opening a road and drilling for water. Only then it was possible to lay the foundations of the first hotel, Sani Beach Club, which was inaugurated in 1971. 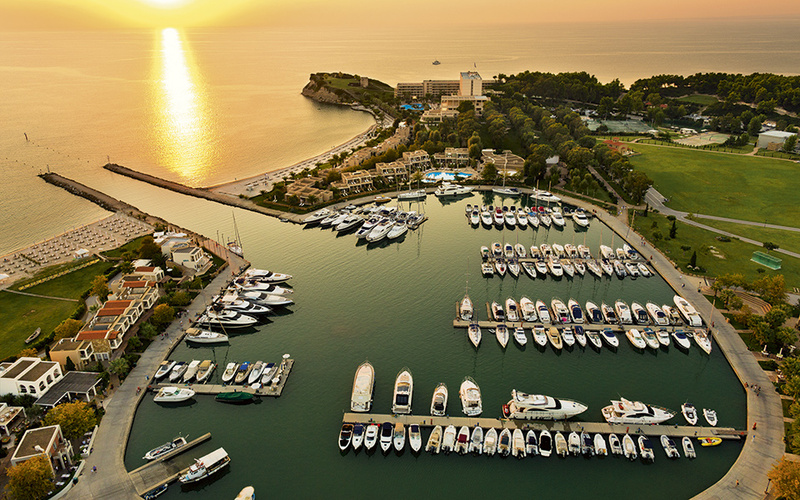 The Sani Beach Hotel followed in 1984 and, after that, the luxurious Porto Sani, Sani Asterias and Sani Marina; The transformation was so radical that it is hard to believe that the location of the Asterias suites is where inmates from the Kassandra Farm Penitentiary once went fishing. 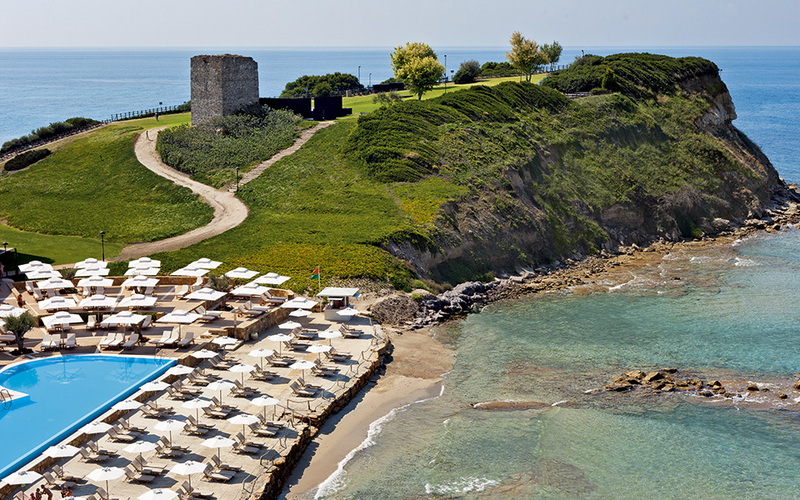 Sani Beach Hotel infinity pool, seen against the backdrop of Sani Hill, with its medieval Stavronikita Tower, where the annual music festival takes place. 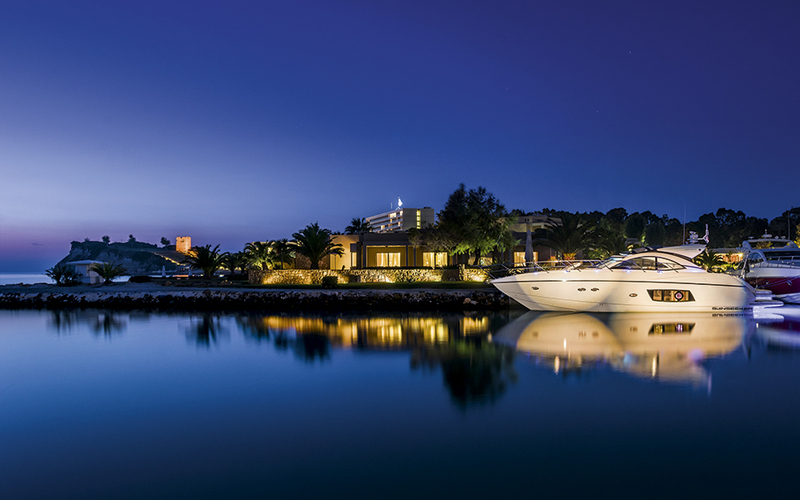 Sani Asterias, a luxurious, all-suite hotel, by night. 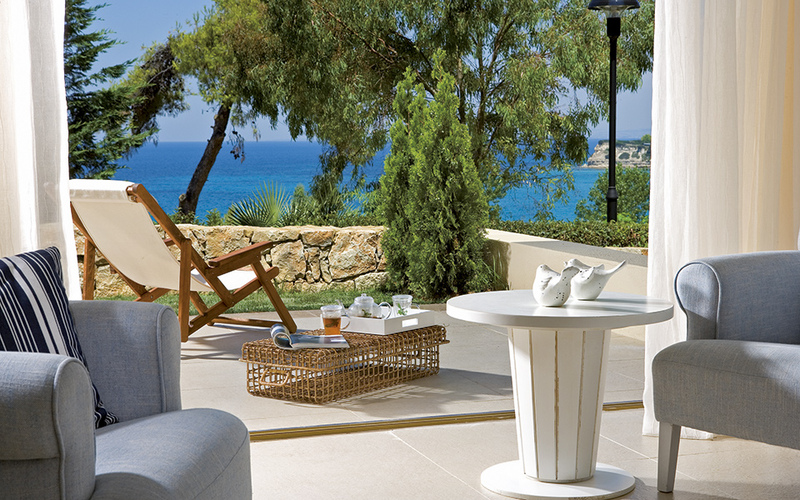 Sani Beach Club Deluxe Rooms have their own private gardens. With a large pine forest, Sani is not just a luxury resort with all the comforts and facilities of a destination of its caliber, but also an active proponent of environmental protection, the arts and gastro-tourism. The Sani Festival, established 24 years ago, serves as a model for the decentralization of cultural events. Curated by Olga Tabouris-Babalis, it has hosted great artists such as Cesaria Evora, Cassandra Wilson, Lila Downs and Lizz Wright, among many others, and has commissioned and produced original works with Greek and international artists. Another event that has helped put northern Greece on the international map is Sani Gourmet, a festival celebrating culture and food. Every May since 2006, acclaimed and up-and-coming chefs from Greece and other parts of the world come to the Sani Resort to present creative dishes and engage in discussions. 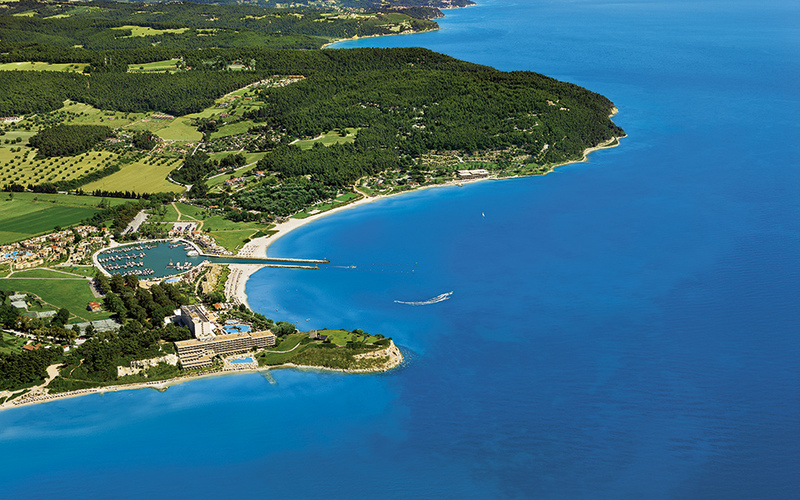 The resort also plays host to the Sani Eco Days summer program of environmental education, which helps highlight the resort’s eco-friendly profile.